The availability and portability of digital data are wonderful aspects of modern life. In my work as a historian I carry literally a complete library around with me on my laptop: scores of period books, newspapers, maps, and military manuals from the nineteenth century. I do much the same thing in my chess work (both technical and historical); both of the 2011 editions of ChessBase’s master database (the unannotated Big Database and the annotated Mega Database) contain more than four million games from throughout chess history. Assuming that a typical print volume of chess games (such as Chess Informant) contains about a thousand games, that’s the equivalent of more than 4,000 printed books – quite literally a complete chess library on a single DVD. All of that data is fully searchable and that search requires just the tiniest fraction of the time it would take to find the same information stored in endless bookshelves of a paper format. But with every form of technology, there’s always a drawback. In the case of digital data the drawback lies in the magnetic nature of the medium. An eBook, a graphics file of an antique map, a chess database, all can be lost through various mishaps. Back in the day, you could accidentally erase a floppy disk just by setting a telephone receiver on top of it; the magnet in the receiver would wipe out the electronic data on the disk by rearranging the pattern of electrons on the disk’s mylar surface. You can still have that kind of accident today; I accidentally left a CD on top of a printer and, after running off a few pages, discovered that my CD was now blank. Hard drives crash, flash drives get lost or get run through the washing machine – all sorts of bad things can happen to your data. But it’s far more common to experience a comparatively minor but no less serious form of data loss: data file corruption. This kind of thing occurs because of the magnetic nature of digital media. If you keep on revising a computer file often enough or long enough, it might eventually become accidentally “scrambled” in the process. This is why you are advised to turn off your computer by shutting down programs and exiting out of Windows instead of just switching off your computer while programs are still running and data files are still in use; that sudden shutdown can scramble the data and make the program or file useless. Now I’m not trying to scare you here; I just want you to understand where we’re going with this article (and the next one). 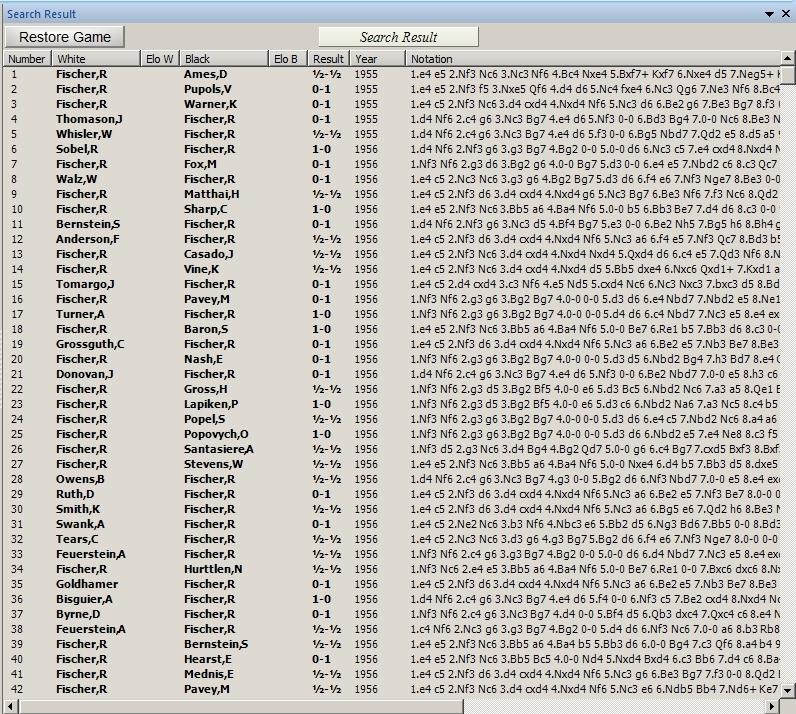 Sometimes you’ll access a ChessBase-format database and see scrambled information, such as garbled header information. More commonly you’ll perform a database search and get some weird results: reversed colors or positions, or games that are unrelated to your search parameters. This is typically caused by some form of data corruption, typically a single corrupted file of the many which, combined, make up a ChessBase database. But there’s a silver lining around this particular dark cloud: in most cases, strange search results aren’t caused by database corruption at all. In many other cases, the problem is 100% correctable. In fewer cases, the corruption is at least partially correctable. And that’s what we’re going to discuss in this blog: how to fix these problems if or when they occur, examining the causes and solutions one by one in turn. The first problem you may encounter is, unfortunately, caused by user error (or, in reality, just a bit of a misunderstanding about how the ChessBase 11 and Fritz12 software works). The best way to fix this kind of database error is to not commit it in the first place. I walked the user through the steps of performing a search for Fischer’s games, making sure that the user was spelling Fischer’s last name correctly, including Fischer’s first initial as “R” (not “B”), and typing the search parameters into the proper boxes of ChessBase’s Search mask. Sure enough, it was all being handled properly by the user but no games were coming up in the search. Then it hit me. “Have you been doing other searches today in ChessBase?” I asked. In my experience, if a user comes up with “empty” search results when there definitely should be some games in a database, there’s an obvious culprit: extra unnecessary information in the Search mask. Be aware of this fact; when you input search parameters into multiple sections of the Search mask (the Game data, Position, Material, etc. dialogues), the result will be games in which ALL of those parameters apply. The various Search mask dialogues are not exclusive from each other; all of the parameters are combined into a single search.. 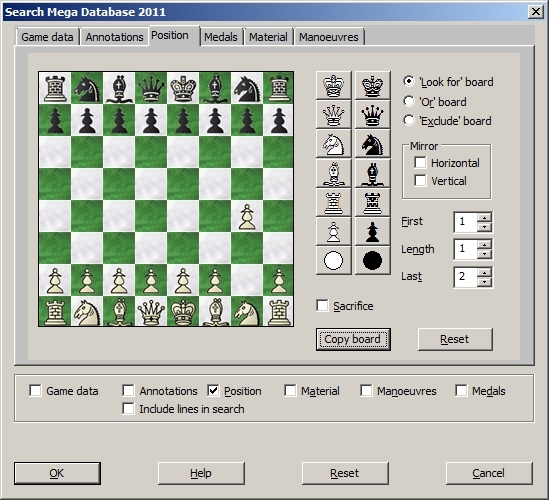 In other words, if you enter parameters for a search on Kasparov’s games in the King’s Indian Defense in under 20 moves in the “Game Data” part of the Search mask and place a Black Knight on c4 in the chessboard display of the “Position” portion, that’s exactly what you’ll get: all of Garry’s short games in the K.I.D. in which a Black Knight appears on c4. So how do we prevent these oversights from sabotaging our ChessBase and Fritz database searches? It’s an simple preventive measure as long as you remember to do it: unless you want to use some element (such as a board position) from your immediately preceding search in your new search, get in the habit of clicking the “Reset” button (the one located between the “Help” and “Cancel” buttons) before starting a new search. As we’ve seen, that “Reset” button completely clears the Search mask of all prior search criteria and lets you “start fresh”. Using it will greatly reduce the chances of your searches coming up “dry”.